My front door was looking a bit bare. 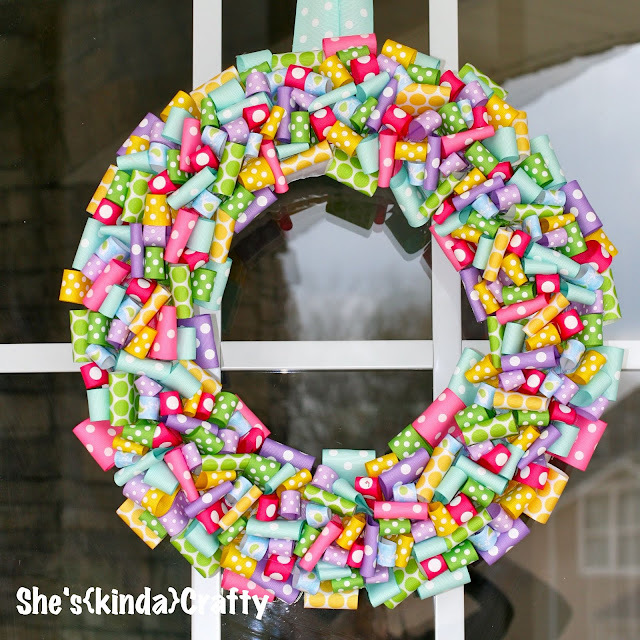 With spring temps in January/February, I was inspired to go use some springy ribbon and a wreath form. My plan was to do a fun ribbon wreath like I've seen on Pinterest, like this one. Nevermind that I've had my supplies for almost a month, just sitting in my studio. Now it's officially spring and my wreath is officially hanging on my door. I started with a 12 inch wreath form and five colors of polka dot ribbon. I had skinnier grosgrain ribbon in my stash in solid colors to match each of the five polka dot ribbons. These were used more as fillers here and there to cover up the green wreath form. I cut strips around 4 inches long and hot glued each into a loop. I found it easiest to cut a batch of strips and get them all glued into loops, as opposed to doing one loop at a time on the wreath. I did not use a pattern for colors or position - just randomly glued my loops onto the wreath, moving around until it was fully covered. I ended up using all of the polka dot ribbon - a total of 45 feet of ribbon! That's not including the grosgrain! Definitely a time consuming project - not hard at all - just time consuming. But I'm pretty happy with the result! I'm on the verge of an obsession with glass jars. I've started a button jar and have a few scrap ribbon jars. The others are empty at the moment, just sitting there looking pretty waiting for a purpose. Some don't have the wire that holds the top on, but I bought some 12 gauge jewelry wire to see what I can do. I know I can at least make the jars into hanging lanterns like this tutorial from Brown Paper Packages.